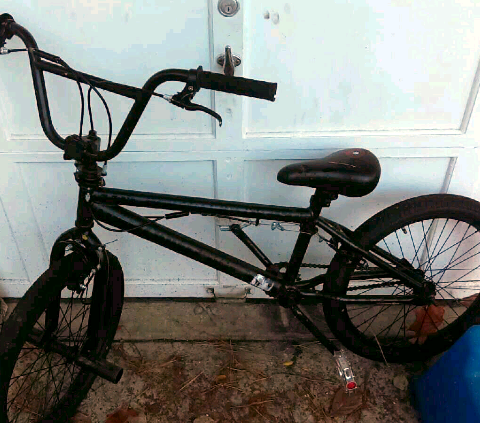 I have purchased this BMX bicycle for $15 USD. Can somebody please tell what kind of BMX this is and if I got a good deal? a potts mod for the front brake, where the cable passes down through the steerer of the fork. a detangler for the rear brake. These allow the front wheel/bars to rotate completely in any direction with no tangling of brake cables. The front axle pegs (foot things) suggest its a tricks or stunt bike. The paint job looks amateur, and will have covered up decals and other identifying marks. Those cranks look really long too, freakishly out of proportion to the rest of the bike. Can you identify this vintage MTB? Can you please help me Identify my Bike? What kind of 24 inch bmx is this?